Planning a fantastic vacation isn’t exactly the easiest of tasks, especially when the world is so full of amazing places to visit. At times, you can be left feeling as if you’ll never get to see everything in this lifetime. But whatever might be on your bucket list, a visit to Arizona should be at the top of it. Yawning canyons, awesome valleys, vast deserts and sparkling waterfalls aren’t the only things Arizona has to offer, and a range of top notch dining, recreational and accommodation options make an already exciting destination that much better. Here are some Arizona essentials you won’t want to miss. Aunt Chilada’s has a rich history. As Arizona’s oldest restaurant with a liquor license, it was first constructed in the 1890s from desert stone and railroad ties. Its first customers were miners eager to reward themselves with an ice cold beer after a long, hard day in the mines. Today, the restaurant is famous amongst locals for serving up some of the best Mexican food this side of the equator. The restaurant isn’t just a place where you canenjoy delicious meals and mojitos. Friendly service and an inviting atmosphere create a wonderful location for just hanging out, and many locals have made it their go-to place after a day at the office or a weekend out hiking. While the food is good, it’s the overall vibe of the place that has turned Aunt Chilada’s into a bit of an Arizona institution. Many travelers make the pilgrimage all the way to Arizona just to see the Grand Canyon, one of the world’s most incredible natural wonders. Measuring 277 miles or 446 km long and up to 18 miles or 29 km wide, it was formed by erosion caused by the Colorado River and its numerous tributaries. The Grand Canyon contains almost two billion years’ worth of geological wonders. There are numerous ways to enjoy the grandeur of the canyon. Most people take one of the national park’s free shuttle buses along the South Rim or drive up in their cars. On the other hand, the North Rim is much less visited and more challenging to get to, and amenities are available only for five months each year. Finally, the Inner Canyon can be explored on a mule or by hiking, although only the most intrepid explorers tend to make the trip. There are lots of places to stay in Arizona, but the Arizona Grand Resort& Spa is the best and most beautiful. Voted Arizona’s Number One Staycation Spot in 2014, this resort is a visual stunner. With 744 suites and villas designed to resemble a verdant oasis in the middle of the desert, the resort transforms your stay into an experience unto itself. Located at the foot of the biggest urban park and wilderness preserve in the world, the resort is also the only AAA Four Diamond all-suite resort in Arizona. Staying in one of the spacious one or two bedroom suites at the resort is a real eye-opener. 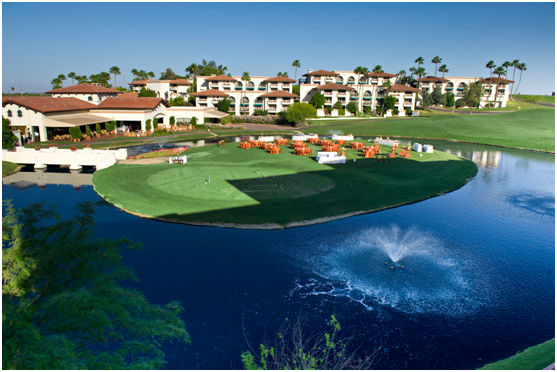 In addition, with a golf course, the best spa in Arizona and water theme park amongst its in-house attractions, many guests check in to the Arizona Grand Resort & Spa and then don’t leave the grounds until the end of their visit. While Arizona’s harsh environment and awe-inspiring natural features make it seem like a difficult place to visit, travelers will be pleased to know it’s actually quite easy to plan a comfortable, luxurious trip to the Grand Canyon State. With fantastic restaurants, luxurious resorts and excellent infrastructure for visiting the state’s most famous sights, a vacation in Arizona should be at the top of your bucket list.